Charlotte, the second child of Prince William, Duke of Cambridge, and Catherine, Duchess of Cambridge, was born at 08:34 AM on 2 May 2015 in Lindo Wing of St Mary's Hospital, London. Several landmarks were illuminated pink to mark the birth, including: Tower Bridge, the London Eye, and the Trafalgar Square fountains, on 3 May, followed by gun salutes at Hyde Park and the Tower of London on 4 May. Later that day, her name was announced as Charlotte Elizabeth Diana, with her two middle names being chosen in honour of her paternal great-grandmother Queen Elizabeth II and late paternal grandmother Diana, Princess of Wales. On 5 July 2015, Princess Charlotte was baptised by the Archbishop of Canterbury at St. Mary Magdalene Church, Sandringham, the same church where her paternal grandmother was christened in 1961. Her godparents are her parents' cousins The Honorable Laura Pettman and Adam Middleton, and family friends Thomas van Straubenzee, James Meade, and Sophie Carter. The ceremony used a font that was made for Queen Victoria's first child. 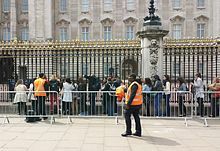 Despite the efforts of her parents to shelter their children from the press, each photograph or public appearance of Charlotte has caused a media frenzy. According to shopping statistics and polls among parents, Charlotte is a major children's style icon. Retailers, particularly in clothing, benefit greatly from their products appearing in photographs of the Princess. Brand Finance have estimated that she will be worth more than £3,000,000,000 to the British economy throughout her lifetime. In July 2018, Reader's Digest valued her at $5,000,000,000 or £3,800,000,000. On 11 June 2016, she made her first public appearance, which was on the balcony of Buckingham Palace during Trooping the Colour. She accompanied her parents on their royal tour of Canada in September 2016 and on their diplomatic visit to Poland and Germany in July 2017. Charlotte started her education at the Willcocks Nursery School, near her family's home in Kensington Palace, in January 2018. Charlotte is, from birth, a princess of the United Kingdom entitled to the style of Royal Highness under letters patent issued by Queen Elizabeth II on 31 December 2012, which gave the title and style to all children of the Prince of Wales's elder son. She is thus styled "Her Royal Highness Princess Charlotte of Cambridge". Charlotte is fourth in the line of succession to the British throne, after her grandfather, father, and elder brother. Due to the implementation of the Perth Agreement, which replaced male-preference primogeniture with absolute primogeniture, she did not move down the line of succession when her younger brother, Prince Louis of Cambridge, was born on 23 April 2018. This page is based on the Wikipedia article Princess Charlotte of Cambridge; it is used under the Creative Commons Attribution-ShareAlike 3.0 Unported License (CC-BY-SA). You may redistribute it, verbatim or modified, providing that you comply with the terms of the CC-BY-SA.